Rukola is actively involved in private label tenders published by both Lithuanian and foreign major retail chains and wholesalers. The long-standing experience and professionalism of the company are reflected in many successful tenders. When developing international trade, we focus particularly on private labels, and this is why we intentionally selected target markets such as the Nordic and Central European markets. Our company cooperates with well-known major retail chains, joint procurement organisations, alliances and individual customers. Every year the company participates at the private label trade exhibition in Amsterdam (PLMA) where we meet our partners and customers. By working closely with our customers, suppliers and service providers we are able to meet the needs of the most demanding customers. are sold in 250ml glass bottles. and rapeseed oils are sold in smaller bottles of 450ml as well. types of oil: sunflower and rapeseed oil. Products are sold in 0.9- liter bottles. supplied to foreign markets is distributed in 0.5-liter, 1- liter, 2- liters bottles. In addition to our main brands, we offer additional brands of “Flarina”, “Dolores” and “Alėja”. 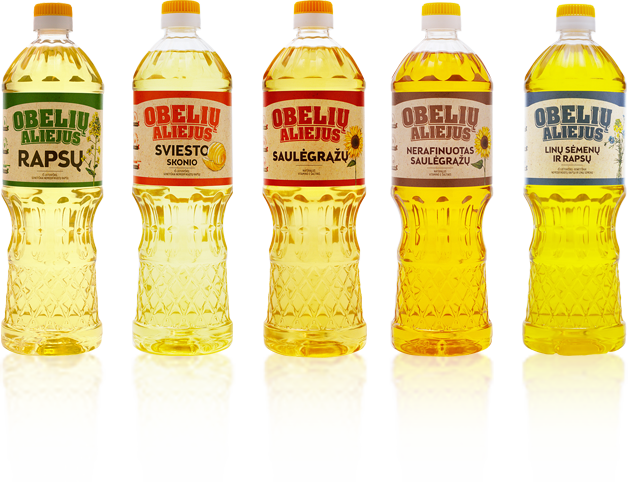 Sunflower oil “Alėja” is sold in the local market. The oil is distributed in in 0.9- liter bottles. 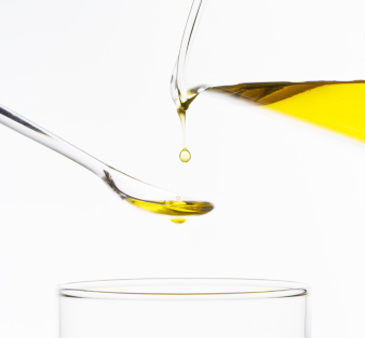 types: sunflower and rapeseed oil, which is sold in 0.9- liter and 5- liters bottles. rapeseed oil. Oil is exported to foreign markets and sold in 1- liter, 2- liters and 10- liters bottles. The highly competitive edible oil market means we must comply with high quality standards. 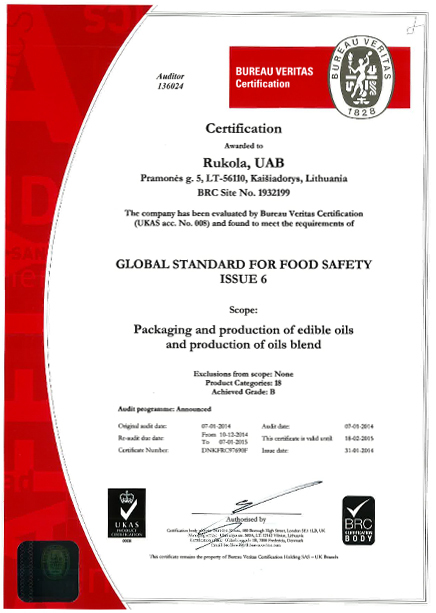 Rukola was granted quality certification by BRC (British Retail Consortium), which is recognised by all major European retail chains, small traders and wholesalers. The company ensures a top quality production process at each stage of its operations. This is confirmed by the 2014 BRC certification. Edible oil can be received both from rail tankers (broad gauge) and road tankers. We can receive over 200 tones of oil per day. Because of the location of the oil reception point it is possible to receive oil even at sub-zero temperatures. Edible oil is stored in 4 x 100 tonne and 3 x 285 tonne air-tight stainless steel tanks. The number and volume of tanks allow the storage of different types of both refined and unrefined oils. The assortment consists of both pre-packaged and bulk products. 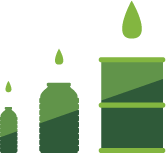 Oil can be supplied in 0.9-litre, 1-litre, 1.8-litre, 3-litre, 5-litre and 10-litre PET bottles and larger volume HDPE containers. There are two 0.9-litre and 1-litre bottle filling lines: 6,000 bph and 8,000 bph. The capacity of the 1.8-, 2-, 3-, 5- and 10-littre bottle filling lines is 3,000 bph. Both 0.9-litre and 1-litre PET bottles are blow-filled on the filling line. Currently we have 5 different designs of bottles. We use 70 mm (length) x 100 mm (height) paper labels. We can supply labels of the required design on several types of paper, coated with regular or UV lacquer. We use a variety of one- and two-component design caps. We can supply your chosen cap colour with a logo. 0.9-litre and 1-litre bottle filling lines are fully automated – starting with blowing a bottle and feeding it to the line, finishing with insertion of the bottles into boxes and boxes onto pallets and stretch hood wrapping of pallets. The stretch hood wrapping facilitates transportation of the production – the units are held together very tightly. Our warehouse capacity is 1,000 pallets. We have a drive-in pallet rack system. This allows us to store a wide assortment of products and accelerates product selection and shipping.